The 84-kilometer Ultra Cavalls del Vent (Horses of the Wind) and its 6,000 meters of vertical gain will be run this Saturday, September 29 in the Spanish Pyrenees. As the fourth of five races in the 2012 SkyRunning Ultra Series, the race is drawing some of the world’s best ultrarunners – you’ll recognize some of the names no matter where you run. With the stiff competition, there’s a chance that the course records – Miguel Heras’ 8:57 and Nuria Picas’ 11:37 – will come into play, with both record holders toeing the line to boot! On race day, iRunFar will provide a Cavalls del Vent live coverage page that pulls together numerous sources. Anna Frost is one of the favorites for this race. Read on for an update on her Cavalls del Vent training as well as her take on the race’s contenders. I am happy. My injuries/niggles/pains have left my body. I feel if I had one more week to train I would be knocking on the door of my TransVulcania fitness. But right now I have shared plenty of blood, sweat and fears on the Cavalls course. I don’t know it like I knew TransVulcania. I don’t feel as emotionally attached to the trails here. But I know it well enough to know that it’s going to hurt. It is going to be long. It is technical and steep – both up and down. I have done what I can do; I am confident for a good race, and realistic that it is going to be a battle with some wonderful friends. Two months uphill/downhill hiking and scree ‘bombing’ at high altitude in Colorado. Three weeks in France, Italy and Austria of running sporadically and inconsistently, but also when my mind and heart wanted it. Nuria Picas, the current record holder at 11:37, is going to be hard to stick with. She has had an awesome year. 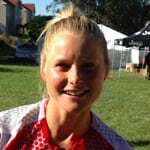 Backing her second place at TransVulcania up with another second-place finish at the Zegama Marathon the weekend later and more recently a powerful win at Trofeo Kima. Her downhill is beautiful, she runs with confidence and endurance and she lives, breathes and eats from these mountains. I would love to run some of the race with her as I have not yet experienced racing along side a competitor in an ultra. I want to see and feel what it is like to go through the motions of an ultra together with someone. She is going to be going battle-to-battle, head-to-head with fellow Catalan runner Emma Roca. I don’t know her personally, but from what I have been told, she has a mind of steel and from what I saw of her at UTMB this year I would not disagree. The locals tell me “she wants this race” and has some unfinished business with it. Emelie Forsberg is another great friend to have along for the journey. She has had some fast and furious results with wins at Pikes Peak Marathon and Dolomites Skyrace and her close second at Kima. This will be her first ultra, but not her first experience of a long time on her feet or skis. She runs with passion and happiness and this carries her through the mountains and toughness with bounding leaps. Her agility and downhill talent will be a quality strength for this race. Miguel Heras is my favourite runner with his magical and mystical eyes. His patience and determination. His respect for the mountain and the people around him – he has had a frustrating year with knee niggles, some successes, breakthroughs and heartbreak. Miguel will race at Cavalls with his friend’s number who sadly passed away last week in a bike accident. Kilian Jornet may join us in his homeland mountains. His focus this month was the Mount Blanc Crossing with his “Summits of My Life” mission, which he has ticked off his list in style. So we may just see an appearance from him. Tofol Castañer has been showing us his strength. Last year in Cavalls, getting to the marathon mark, and being surprised he was in second, he carried on to finish his first-ever ultra. Now he has just won the CCC. If his legs have recovered, he will be strong. He knows the course and has raced it. I believe that this gives huge benefits as you know how the body can respond to such a course. Dakota Jones is no stranger to hurt for the steep uphills and long time on his feet. Showcasing that in two Hardrock 100 finishes and getting to the heart of SkyRunning at Gringe. He will have the speed needed for the fast contouring sections and also the cheery freedom to take him flying down the hills. His assurance and maturity in his races far surpasses his young 21 years. Antonio Krupicka is only a couple of races back from injury, but in flying form when it comes to technical speed, agility and up and downhill power. With all his mountain scrambling on the Colorado 14ers, he will have the lungs and legs to fuel him over the long 84 kilometers with 6,000 meters vertical. With 1,000 competitors chasing, I’m sure there will be many more powerful men and women that I haven’t mentioned that could easily be in for the podium taking. And let’s face it… whether we are going for 30 seconds under the record time or 30 seconds before the cut-off time, it is a long time for anyone to be doing anything. Anything can happen in that time. It is a race of mental strength, of power, of endurance, speed and spirit. Whoever that all comes together for on that day will be the winner… the winner of the personal challenge… to get to the finish in whatever time that may be. To share that experience with all out there, the volunteers, the supporters, the mountains, their horses and the valleys and their rivers. Who do you think will take the men’s and women’s podium spots at Ultra Cavalls del Vent? Who else is going to be in contention for the top spots? Folks who’ve run the race, tell us what it’s all about! Its great to have an intimate perspective from one of the runners, thanks Anna! The presence of Kilian Jornet at the starting line is already confirmed, have a great race Anna ! Looks like the sky running series is where things are headed. Clearly it is getting the best fields on the hardest courses. Hoping to see more sky running in america. Agree, looks like Skyrunning is becoming the 'ATP' tour of trail and ultra-running. I am hoping for an epic battle between Dakota and Kilian, who is pretty much impossible to bet against if he is going to be there. Forsberg for the podium on the ladies side! Please remind Dakota and Anton that they are allowed to cut switchbacks! That is important to remember :). What a line up! I have such a soft spot for Anna and emelie sp I hope either of them take out the women's. Anton…what more can be said?! Get after them brother! I'll be cheerin for ya from Bundaberg Australia!!! Should be an amazing race, and with almost 20,000 feet of gain in ~52 miles (MIND BLOWING) people should be good and cooked by the end of the race. Did anyone notice the sheer NUMBER OF HOURS that Anna put in during those two weeks? She's stating she exercised ~80 hours in 2 weeks. Granted a lot of that is power hiking in the high mountains… but again… mind blowing. Look at someone who does HUGE volume… like Tony K… according to his blog he'll do something like 24 hours in a week… she's doing 50% more than THAT. Not saying pro or con, just saying that's a LOT of cardio and pounding on the body. 1.) Tony v Frosty: Frosty put up crazy numbers for 2 weeks. Tony has been doing it for what seems like months on end. I think I could muster 2 weeks of her volume.. might result in an injury, but still. However I know I couldn't replicate Tony's summer. 2.) How much can 2 weeks of insane training really effect our fitness? Not trying to be sarcastic but a legit question. 3.) All that being said Frosty is a beast. I hope Tony can pull out a win – it has been 2.5 years. This course should agree with him. Anna will smash the womens. Terry Conway… Go Terry! Go Terry! Good luck Anna! crush it!